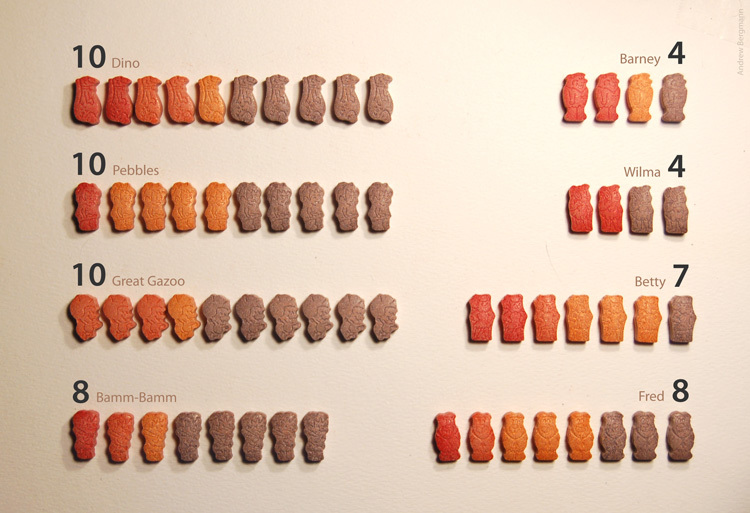 I popped opened a new bottle of Flintstones vitamins and was curious about the distribution of characters. Note that this data set is based on the one single bottle (unit NAA045F) so no conclusions can be made beyond it. The biggest surprise of the batch was the abundance of Great Gazoos. Although he was ubercool, the tiny airborne alien voiced by Harvey Korman only appeared in 13 of 167 episodes. Gazoo was a special treat on screen, so I would have expected him to follow suit in vitamin form. However, he ranked at the highest count of 10, matched only by Dino and Pebbles – also non-headliners of the show. There were 61 vitamins in total, and the label only claims to sport 60, so major bonus for us! My apologies to the less fortunate family out there who only got 59. I wonder if I’ll ever have time to post to this blog again.